Located on the 7th floor of Macy’s Chicago State Street store, The Walnut Room has the distinction of being the first restaurant in a department store, and it’s also the longest continuously running restaurant in the country. Opened in 1907, the popular dining and gathering spot was originally known as the South Tea Room. 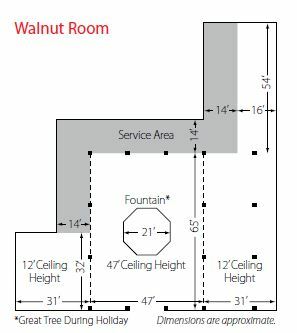 It became known among the ladies of Chicago as The Walnut Room due to its beautiful Circassian Walnut paneling, and by 1937 the affectionate nickname had become the official name.